Eset NOD32 is a popular antivirus application for Windows and Linux. The advantage you might have seen in an Eset product is the speed and effective malware detection. In these days viruses are spreading thier wings to mobile devices. Each mobile OS platform is vulnerable to specially designed malware that can steal passwords, personal and banking information. Many antivirus vendors have already launched a mobile edition of their software. 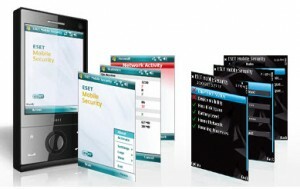 Eset has also joined the league by announcing a mobile antivirus application for Windows mobile phones. This application is supported on Windows mobile 5, 6.1 and 6.5 versions. Eset mobile antivirus will work on HTC, SonyEricsson, Palm, Samsung mobile phones running Windows Mobile OS.The minimum memory requirement is 1MB for installation and scanning. Protection from unknown mobile viruses through heuristic detection. Database updates via internet connection. Download Eset mobile antivirus Windows mobile and Symbian here, Android here. All versions of ESET Mobile antivirus comes with a 30 day trial. You have to register with a valid email ID to get a user name and password that can activate the product. may we can exchange link? hi… i have a samsung champ C3303 and can i get and download antivirus for my device..? I have just purchase Nokia E63 Mobile. Which antivirus is best for me to avoid virus on it. It have Symbian OS 9.2, Series 60 v3.1 UI. I want to surf Wi Fi Internet on this handsets. Please Guide me in proper way. Hi My Mobile is Samsung c5212. I want a free mobile antivirus. Can anyone please send me a link on my no. 09475639230 ? If not… Just specify the name of the antivirus, and I will do the needful. I have sony ericsson w350i. my cell is samsung gt c3303. i want a antivirus. how i get it shortly. I need a good antivirus software for my mobile phones.